Posted in: Data Science. Tagged: data science, OCR. My PHYS341 students were interested to see how the OCR routine processed their attendance sheet, so I applied it, as shown below. The left panel shows the original, the right the transformed version. 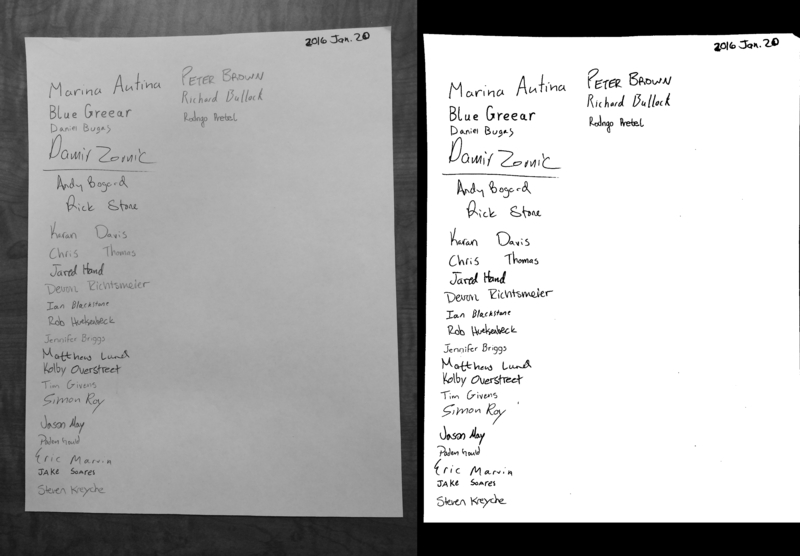 The routine did a reasonable job of un-distorting the page (although it wasn’t too bad to begin with). I’m not totally sure what went wrong. Maybe I should have them write their student numbers instead. 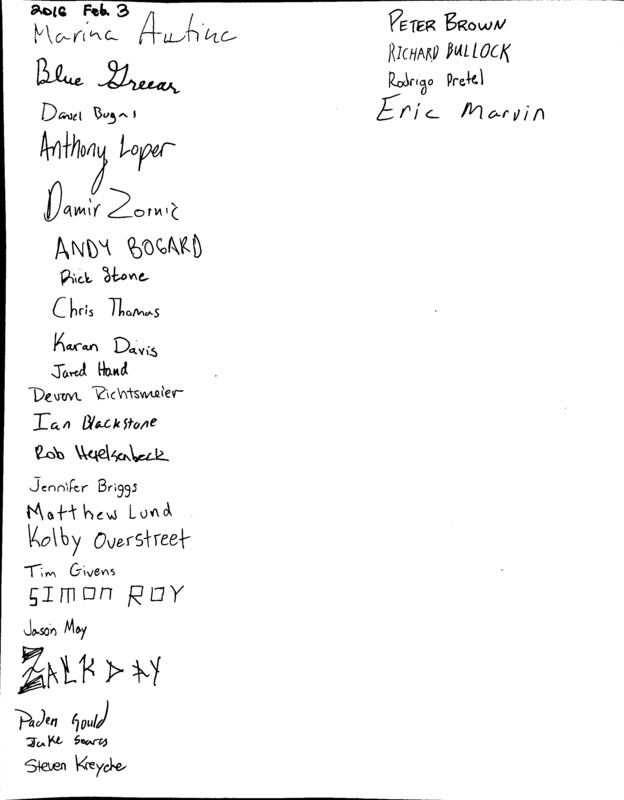 Here’s another go with a different attendance sheet. Not much better. Posted in: Teaching, Uncategorized. Tagged: classical mechanics, ipython notebook, python. I’m prepping for my classical mechanics course, scheduled to start next week. One of the first things we discuss is uniform circular motion and how it looks projected along the x- and y-axes, so I thought it would be useful to have an animation showing that. I found a few animations online, but none really showed the x and y projections I was looking for. So I decided to create my own using my go-to language of choice Python. Fortunately, python guru Jake Vanderplas has created a very nice animation module usable in iPython Notebooks. I spent the morning kludging together a python script to convert a grocery receipt into a spreadsheet as part of one of my New Year’s resolutions. 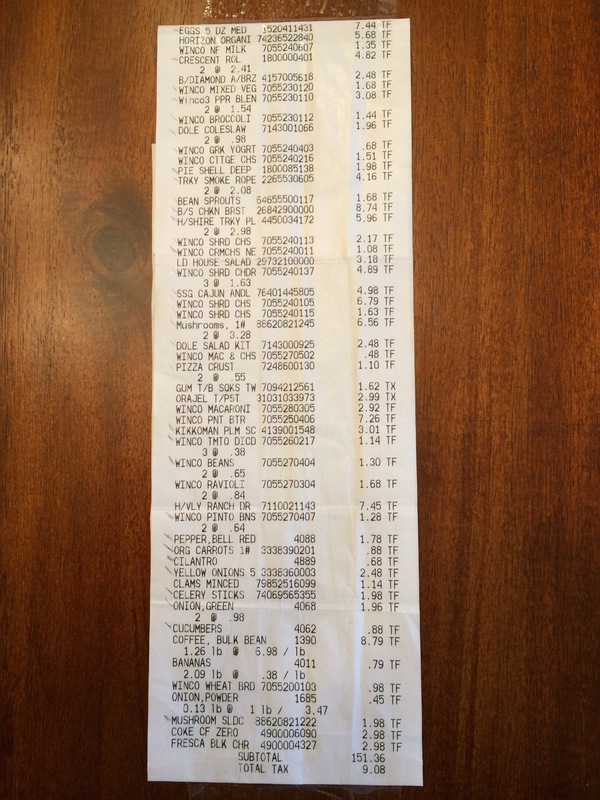 There seem to be a few options out there for scanning and recording receipts, but it’s not clear that they apply an OCR technique to automatically convert them to spreadsheet. (left) Edge detection, (center) Outline detection, (right) Scanned version. To detect edges, the code converts the color image to grayscale and applies the Canny edge detection scheme, which involves applying a Gaussian blur to suppress noise, calculating image derivatives, and looking for large values. The result is shown in the image above on the left, and more details on the algorithm here. 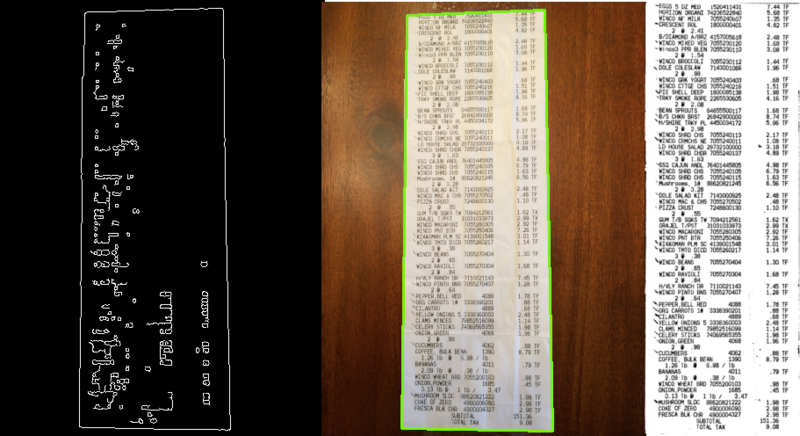 Next, the code finds the outline of the receipt by using the OpenCV‘s findContours, sorts the contours by area, and finds the contour with the largest area but with four vertices. The code then applies a four-point transformation to warp the receipt to give it a rectangular shape and finally thresholds the grayscale to enhance the contrast. The rightmost panel in the above image shows the final result. To convert the image to a table of text, I used PyTesseract, which provides OCR capabilities. I installed the package Tesseract using homebrew: “brew install tesseract”. The “psm=6” option was required to return the text properly. The prices on all lines came back fine, but the description was often distorted. I decided I cared more about the price anyway. 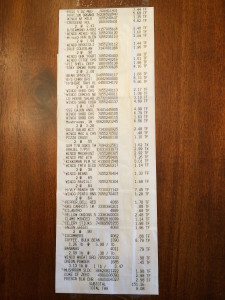 Fortunately, the WinCo receipt had “TF” or “TX” at the rightmost side, so I performed a regex search to find the beginning of that string and grabbed the characters to the left of that. On the off-chance it will be useful to someone else, I’ve posted the code here. Using my script will also require the source code for pyimagesearch, which requires submitting an e-mail address.